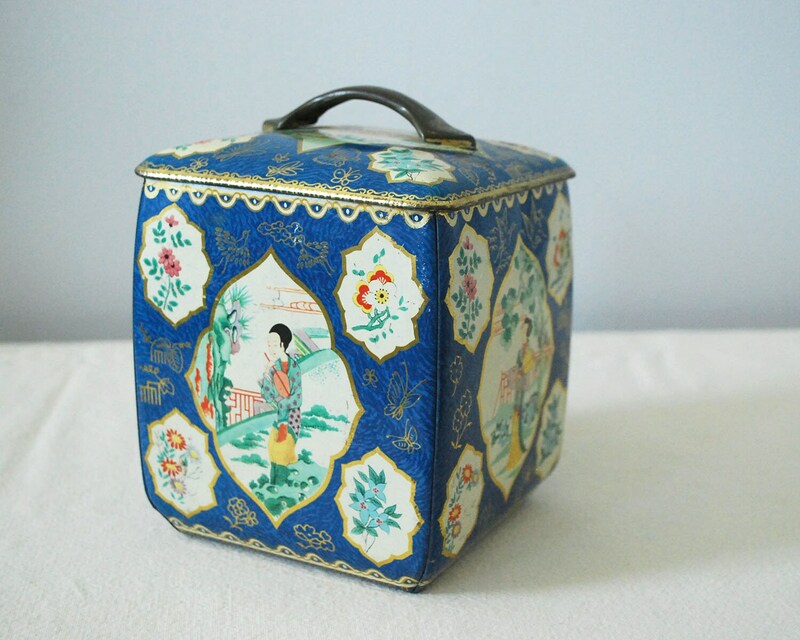 Charming vintage lithographed tin box or canister, with an Asian influenced design of women in traditional kimonos, flowers, birds, and butterflies. The tin has a blue background with gold trim and decorations, plus gold framed illustrations that have a cream background and brightly colored flowers. Each side features a woman in a natural landscape (two images, repeated on opposite sides). The top also has a landscape with mountains and clouds, plus a raised handle. The tin is marked on the bottom Container Made in England; it dates to the mid 1900s. It's in good condition, with some wear on the images, some scratches, a very small amount of rust, and a couple of dents. The lid fits snugly.